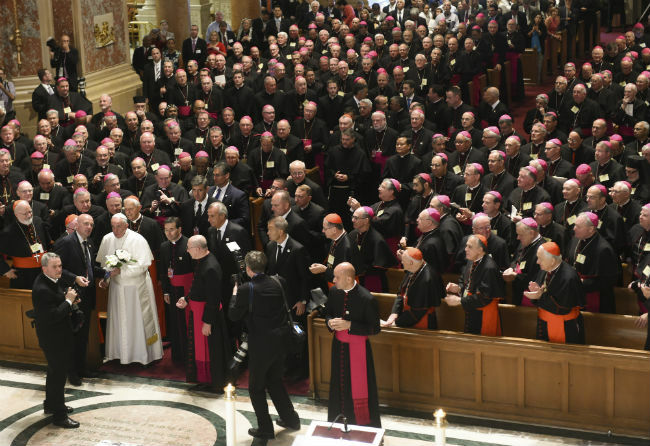 WASHINGTON (CNS) — Pope Francis had much to say to the U.S. bishops during his remarks at a midday prayer service at St. Matthew Cathedral in Washington Sept. 23, the first full day of his U.S. apostolic journey. Because of that, different bishops could take away different things. What resonated most for Bishop Daniel E. Flores of Brownsville, Texas, was the pope’s remarks about immigration. “It’s a historical legacy but also something very, very real” today, Bishop Flores told Catholic News Service after the prayer service had ended. Retired Bishop William K. Weigand of Sacramento, California, echoed the points made by Archbishop Lori and Bishop Flores. For others in attendance at the cathedral, the takeaway may have come just in being there. Margarida Alves, a Brazilian immigrant who came to the United States 31 years ago, got her ticket, she said, because as a member of the cathedral parish she has been volunteering at St. Matthew since she retired two years ago. “I help them to clean and polish and wash for the service. Everything they need me to do.” Now that she is retired, “I have time for my church now,” Alves added. Gallego added, “We’re just lucky the Metro didn’t have any problems.” Even before the sun was up, Metro, Washington’s subway system, was reporting delays on five of its six lines, including the Red Line closest to the cathedral. They got lucky in another way: “We won the holy lottery” for tickets, Gallego said. One attendee who didn’t have to worry about the commute was Father Rafael Barbieri. Although he hails from Brazil, he is parochial vicar at St, Matthew. 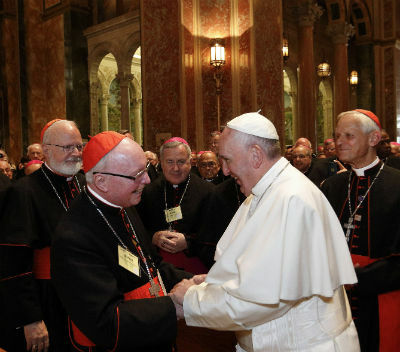 His position at the cathedral, though, was no guarantee that Father Barbieri would get to shake Pope Francis’ hand. “Only when he goes down the aisle will I have a chance to say hi,” he said. Father Barbieri’s boss — Msgr. W. Ronald Jameson, the cathedral rector — was busy greeting parishioners who were filtering into St. Matthew well before the 300 or so bishops arrived.